Attend Give Camp or the X Conference? Both! Torn between attending Lansing Give Camp or the Kalamazoo X Conference? You don't have to choose; do both! Give Camp or X Conference? The first ever Lansing Give Camp is being held April 24-26. The first ever Kalamazoo X Conference is being held April 25. The sessions of the X Conference offer a great opportunity for learning and for improving your craft. For $20, you can't beat that. But Lansing Give Camp is a weekend of giving back to the community by helping out local charities. Coding for a cause; you can't beat that, either. Two amazing events, slightly more than an hour from each other, are being held the same weekend. It's like a bad case of deadlocked threads. Kalamazoo or Lansing? Lansing or Kalamazoo? How do you choose between them? You don't have to choose. Go to both. Spend the weekend in Kalamazansing! Kalamazoo X Conference and Lansing Give Camp have partnered together. Lansing Give Camp will have special projects that will accommodate X Conference attendees. Kalamazoo X Conference is waiving its registration fee for anyone attending Lansing Give Camp. Friday night, come out to Give Camp. Saturday morning you can grab a shower (thanks to a partnership with the Lansing YMCA), and head out to Kalamazoo. When the event is over, finish out the weekend back in Lansing, coding for a cause. It's almost like one big event, spread between two Michigan cities. Kalamazansing. I want to go to Kalamazansing! Sign up Lansing Give Camp at http://www.lansinggivecamp.org. The registration form includes an option to sign up for the X Conference, too. We'll take care of the rest. On April 24th-26th, 2008, the local software development communities will pool their talents to put together the first ever Give Camp in Lansing Michigan. The event will be hosted at the Impression 5 Science Center in downtown Lansing. For more information, please visit the event's web site, http://www.lansinggivecamp.org. What is a Give Camp? A Give Camp is a weekend-long event where software developers, designers, and database administrators donate their time to create custom software solutions for non-profit organizations. This custom software could be a new web site for the nonprofit organization, a small data-collection application to keep track of members, or an application for the Red Cross that automatically will email a blood donor three months after they've last donated blood to remind them that they are again eligible to donate blood. The only limitation for a Give Camp project is that it must be scoped to be completed within a weekend. During the event, developers are welcome to come and go as they please. The event will continue 24/7 from Friday afternoon through Sunday afternoon, and developers can choose to go home in the evenings or camp out for the entire weekend. Showers are not available at the Impression 5 facility, but the Lansing YMCA--just down the street--is donating their facilities throughout the weekend for any Give Camp attendees. If you are a developer and are interested in attending, please go to the event web site and register for the event. We are looking for developers of all skill levels to help out, from students to senior developers, and for developers of all skill sets, including designers, developers, database administrators, and more. If you can code, we want you there! Lansing Give Camp is seeking cash donations of any amount, or the sponsorship of a meal. A meal sponsorship would entail funding breakfast, lunch, or dinner for roughly 100 volunteers. Typical meals would be sandwiches, pizza, or BBQ. As consideration for your donation, your organization’s logo will be added to the Give Camp web site, along with mention during the opening and closing sessions. Have you ever made comments when committing in to source control that you wish you could take back? Perhaps in a rage, you entered "Jimmy's code was a pile of fermenting humus that didn't work. So I fixed it!" Now you realize that Jimmy will see it, your boss is going to see it, and you want to change the comments to something that has a bit more tact. Or maybe your reason is far less malicious: you identified a major bug that you just committed, and you would like to update the comment log to say "Don't use this revision. It has a major bug." In Subversion, the comments can be updated long after the original commit. Log messages are just a property on the repository revision. <REVISION> : The revision number of the target log message. <MESSAGE> : The value of the new log message, wrapped in quotes if necessary. <URL> : The base URL of your repository. Since this applies to a revision property, rather than a file property, only the base URL of the repository is needed, rather than a URL directly to a file. But next time, do try to be nice to Jimmy. Increasing or decreasing the font size of your code in Visual Studio's text editor is almost required whenever VS is fired up on a projector. Anyone who has had to demo code, or give a talk at a user group, or present new technologies to their team has experienced the pain of increasing the font size through the Tools -> Options menu, followed by an inquiry to the crowd: "How's that? Is this font size readable by everyone?" Often times the selected size is not quite the right solution, and the process is repeated. Life as a presenter would be easier if only you could modify the font size through a simple keyboard command, similar to how browsers enable you adjust the font through the ctrl+ and ctrl- commands. Fortunately, this is easy with the help of Visual Studio's Sample Macros. To help show you the ropes of writing custom macros, VS ships with a collection samples, and two of these samples respectively increase and decrease the font size of the text editor. Right out of the box, Visual Studio comes with the ability to modify the font size for your code; all that remains is mapping these macros to the keyboard. Anchoring these macros to specific keyboard commands is a simple process. From Visual Studio, access the Tools -> Options menu. In the Options window, navigate to Environment -> Keyboard. Using the "Show commands containing" input, enter in IncreaseText or DecreaseText. The list of available commands will automatically filter as you type, reducing the list to the applicable macro. 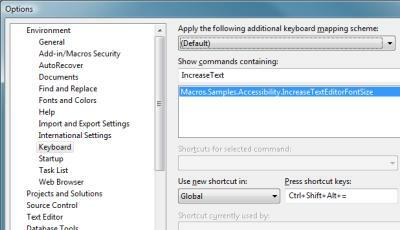 Select the macro command, and select the "Press shortcut keys" input, and enter your desired keyboard command. Click the Assign button to set the command. I use "Ctrl, Alt, Shift, =" (plus) and "Ctrl, Alt, Shift, -" for my Increase and Decrease commands, respectively. Last week was CodeMash 2009, a developer's conference in Sandusky, Ohio. The conference, which lasted from Wednesday, January 7th, through Friday, January 9th, was held at the Kalahari Resort, a hotel and indoor water park; this makes the conference unique, as families are able, and encouraged, to join the attending developer for the week, and while the developer is off learning about the Next Big Thing, the significant others, spouses, and children are off enjoying the fun of the water park. As for the conference itself, it is billed as an event where opposing developer communities congregate and mash together. Attendees are encouraged to exit their comfort zone—.Net developers can attend sessions on Java or Ruby; Java developers can attend sessions on Azure or .Net—allowing a seasoned developer to get a new perspective, and allowing communities to cross-pollinate ideas and practices. This was not only my first CodeMash as a speaker, but also as an attendee, and it will not be my last. As Brian Prince points out, we developers love to start lists with zero. It's cool, now that we no longer think digital watches are a pretty neat idea. Day Zero at CodeMash was the Precompiler, an optional extra day of sessions that was new feature of the 2009 event. Unlike the conference's traditional hour-long sessions, the precompiler is split into two half-day sessions, allowing attendees to take a deep dive into a particular topic. For me, it was a dive into Ruby by Joe O'Brien and Jim Weirich and into Windows Azure with David Aiken. In the Ruby session, @objo and @jimweirich used "koans" to teach Ruby to the attendees. Effectively, these koans were unit tests coded in Ruby against the Ruby language. Each test purposefully failed, and the process of correcting the code of the each test progressively taught more and more about the ruby language. The tests begin with assert false which must be converted to assert true to pass, and proceeds through conditionals, strings, arrays, hashes, blocks, and beyond. Ingenious. In the Azure session, @thedavidaiken, the evangelist for the Azure platform, gave a once-over and code demo to Azure. After this talk, I'm very excited about playing in the Azure sandbox, and have been brainstorming for a good topic. I have since gotten my invite into the Azure CTP, and should be making sand castles, soon. Other precompiler sessions were available, including 101-level sessions on iPhone development, Java, and more, and what I have only heard described as a phenomenal talk by Mary Poppendieck on Value Stream Mapping. Also, an all day CodeJam allowed any of the attendees to pop in and code with their friends, colleagues, and other attendees. I wish I could have cloned myself, and attended some of these other sessions. After a night that included a few hours of water park slides followed by a few hours catching up with people I hadn't seen since DevLink 2008 or last fall's Ann Arbor Day of .Net, the conference officially kicked off with breakfast and a fantastic keynote by Venkat Subramanian. Then it was off to a day of sessions and Open Spaces, split by a keynote by Mads Torgersen during lunch. I attended Jeff Blankenburg's A Lap Around the Live Framework and Mesh Services talk, and stopped in to Bryan Weber's Functional Concepts for OOP Developers talk for a bit, all in between preparing for my talk. The Open Spaces, where this year's theme was Techniques, Not Tools, are always a part of my day at conferences, especially since these were facilitated by Alan Stevens. Any time he is involved in organizing an event's open spaces, the attendees are in for a treat. We had some great conversation on testing practices and on pragmatic learning (which incidentally spawned another open space on Day Two on mentoring. During Day One's final block of sessions was my talk, Continuous Integration: It's More Than Just a Toolset. Though this was my first presentation at a conference, it went off great. Having given this talk a few times prior at various area user groups, I was comfortable with the talk and had all of the bugs worked out. I was fortunate enough to have a sizeable crowd and great questions from the audience. I am looking forward to speaking, again. The second day kicked of with another breakfast keynote, this time delivered by Eric Meyer. I spent the entire day involved in open spaces. Alan Barber convened a discussion on Getting in to Speaking. Rick Kierner convened an open space on having and becoming a mentor, a topic that originated from the pragmatic learning discussion from the prior day. I hope that the outlines of these discussions make its way to Heartland Open Spaces, soon. The day, and the conference, ended with a trip to the open spaces Closing Circle followed by the Closing Giveaway. The Closing Circle, open to anyone who wished to participate, is where we could all look back on the open spaces of the event, and discuss what we liked and provide constructive feedback on how to improve for next year. Alan did another great job with organization; I would have liked the open spaces to be in a more prominent location, to help introduce open spaces to the crowd, and apparently, this is already taken care of for next year. The Closing Giveaway in the conferences Great Hall ended the show for everyone with an hour of prize giveaways, which included two XBox 360s, a Wii, the full Rock Band 2 set, the full Guitar Hero World Tour set, and much more. My number was cursed; I did not win a thing. I'll have to acquire Rock Band 2 through some other means. This was my first CodeMash. I loved it. It is a very cool event, for if no other reason than it is great to have the conference and the hotel room be in the same building. I enjoyed the opportunity to learn new things that were outside of my day-to-day space, as well as share the wealth by giving a talk to others. I look forward to next year, and I hope that they will again have me as a speaker. Thank you to all of the CodeMash organizers for a great event. My earlier post on creating custom brushes in Google Syntax Highlighter (Extending Language Support in Google Syntax Highlighter) contains a rudimentary brush for ActionScript. The original is designed for Stone Soup; it is something to get an AS brush established, but is not meant to be exhaustive. I have revisited the brush and added some meat. The bush should now supply a more thorough coverage of the language. A download is provided below. Display syntax-highlighted ActionScript using a traditional Google Syntax Highlighter <PRE> tag, using as or actionscript as the language alias.